I’m supposed to tell you that The Mountaintop is about Martin Luther King Jr.’s fictional encounter with a motel maid the night before he is assassinated. That’s not what The Mountaintop is about. I mean, technically, yes, that is what happens in the play but The Mountaintop is much much bigger than that. It’s just two people in one room for 105 minutes but it’s as big as I’ve ever seen theatre be. With key assists from Andrew Smith and Kevin Lamotte’s use of projections and light (a perfectly executed close spot plays a memorable role), the ever-incisive Philip Akin directs the acting partnership of the year in one of the most stirring productions to play in Ontario in quite some time. Kevin Hanchard’s performance style has been distilling for years to reach its present incarnation full of power and carefully chosen stillness. He resists the urge to mimic his legendary character while capturing key elements of MLK’s presence and adding secret vulnerabilities and disarmed moments of almost goofy approachability. Hanchard’s career-defining performance (a large claim considering he currently co-stars on the biggest TV show in the country) is matched only by the goddess Alana Hibbert in her first major non-musical role. I’ve been watching both these performers for years (Hibbert’s resume even includes a My Theatre Award for Ragtime in 2012) but none of their excellent previous work has even come close to the extraordinary nuance and strength of these two performances. They really are a sight to see. 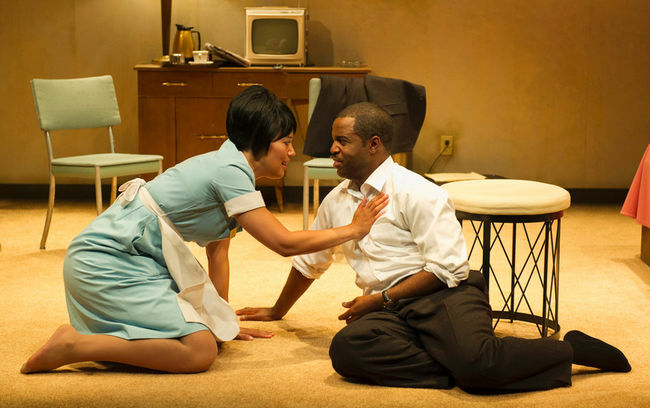 I can’t tell you what The Mountaintop is about beyond the fact that it is Kevin Hanchard and Alana Hibbert in a single room for 105 minutes as directed by Philip Akin (and that it portrays Martin Luther King Jr.’s fictional encounter with a motel maid the night before he is assassinated). But I can tell you that you’d be a fool to miss it.